Car Combi Cleaner is a water-based cleaning detergent with "Wax & Shine" effect for vehicles – clean, wax and shine in one operation. 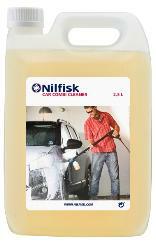 Car Combi is also an excellent detergent for washing motorcycles, bikes, MTB and caravans. Car Combi is a gentle - but very efficient detergent to remove dirt, oil and grease. In addition, the Car Combi detergent gives a water-repellent surface and also gives the lacquer a great depth and shine. Always test on a small area to make sure the surface tolerates the cleaning detergent. Packaging may be recycled in accordance with local regulations. Readily biodegradable surfactants in accordance with EU legislation. Store in frost-free place.